Complete any decor with our handcrafted Aspen Mirror and let the natural warmth of the solid hardwood and timeless style make the perfect statement piece. Perfect for a hallway or entryway wall, this mirror is made from solid pieces of North American hardwood and crafted with a simple Mission style that is versatile enough to look great anywhere. At the center, a beautiful beveled edge mirror is framed in solid hardwood, offering a place to take a quick glance before you head out the door. Below, a classic slat design is finished with a cross frame that offers four hooks that can hold anything you'll need as you come and go. The timeless through-tenon construction is present on both sides, leading up to a large shelf space that can also serve as storage or display to keep things close at hand. 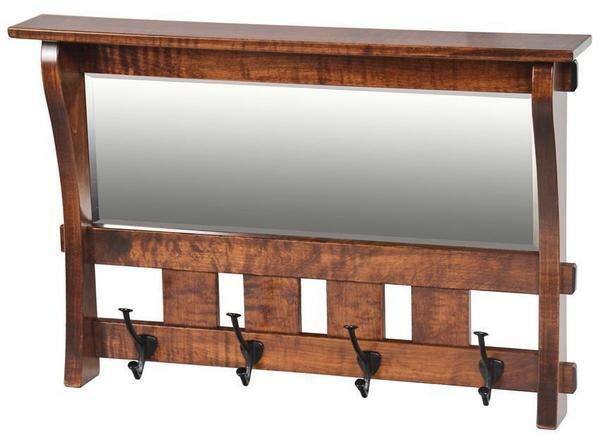 Customize this mirror to match your furniture by choosing the hardwood and finish combination that will complement your space. We also offer the ability to customize dimensions for this piece, along with a special stain request. Please call one of our furniture specialists today for a free custom quote. 28.25" x 4" x 18"